Here Degas creates an image of modern life for the Salon. 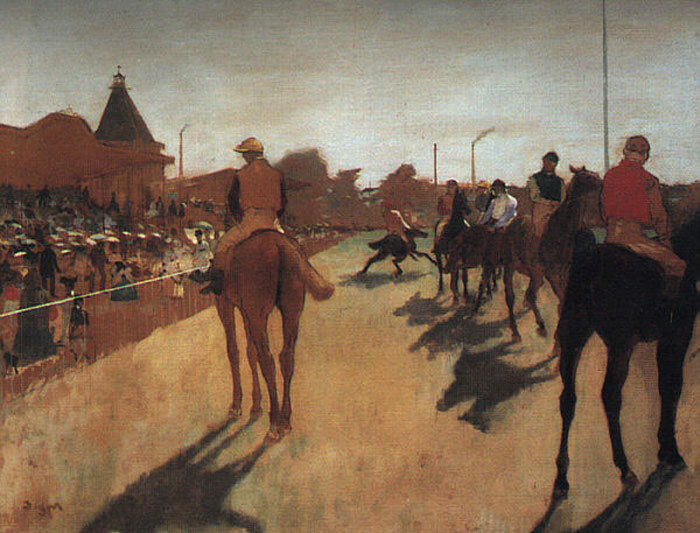 Viewers would have been familiar with this type of scene Degas depicted, as horse racing had become increasingly popular in France, particularly during the 1860s. A number of prestigious races had been established, most notably the Grand Prix de Paris in 1863. SPECIAL NOTE : The painter will make the reproduction as close to the original oil painting as possible. If you want your painting to alter from this likeness, please email us and " Racehorses in Front of the Grandstand, 1866-1868 " will be reproduced according to your special requirements.